Machu Picchu is an unforgettable sight to see and something not easily forgotten. Located in the Andes Mountains, surrounded by mysterious cloud forest for many people it is even more the location of this amazing Inca site than the actual architectural features of the site itself. Therefore it is no surprise that for many people one of the highlights of their visit to Machu Picchu is finding a spot from above to marvel at the entire grandeur of this amazing site. For most people this means hiking Huayna Picchu Mountain or in case this would be sold out Machu Picchu Mountain. 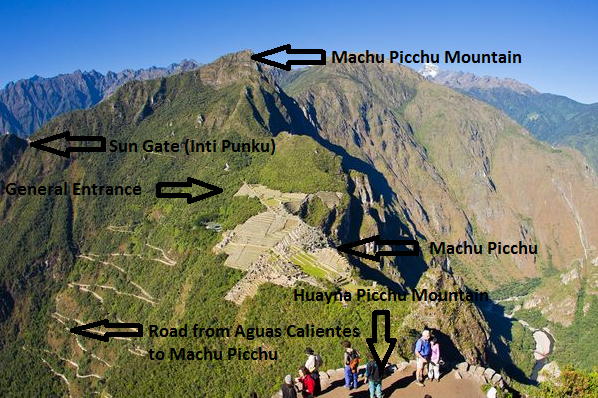 These are the two mountains that make up “the saddle” Machu Picchu is located in. The hikes are quite steep but the views from both mountains are spectacular and very much make up for the effort to get there. The main part of Machu Picchu (the normal Machu Picchu entrance tickets) will be completely open to the public and there will not be any hinder for the visitors to the main part of the site. Other parts of the site such as the Sun Gate (Inti Punku) as well as the Inca Bridge and the site museum (which is not located at the entrance of the site, but closer to Aguas Calientes) will also be open to the public without any hindrance. Therefore the best alternative for people visiting Machu Picchu during this month would be to hike to the Sun Gate, where the Inca Trail arrives to Machu Picchu as from here one can have amazing views of he site and its surroundings. There will not be made any exceptions on this so in case the climb to Huayna Picchu or Machu Picchu Mountain would be paramount for your visit, you can best move your trip before or after April 2016.